RAMPS ARE TRANSPORTABLE IN 1T TRAY UTE OR LARGER. In addition to forklift sales, we work with you to supply a complete solution to your materials handling needs. Our container ramps for sale or hire mean that you don’t need a permanent docking bay to load or unload your goods, just simply set up your container ramp and you’ll be able to move your forklift in and out with ease. Our team at Lift Truck Brokers can work with you to ensure you have everything you need for any project. The loading and unloading of storage containers, vehicle trailers, and other heavy storage options can be done easily with our selection of container ramps at Lift Truck Brokers. All container ramps are available for hire in and surrounding Melbourne, along with Australia wide delivery option. We offer a variety of weight requirements and other dimensions you may need and are available to assist you with any questions you may have. With our container ramps you can simply set up and move your forktlift in and out with ease; so you won’t need to invest in a permanent docking bay to load or unload any goods. Container ramps allow the safe movement of items in and out of storage containers so that you can ensure a safe workplace or project. 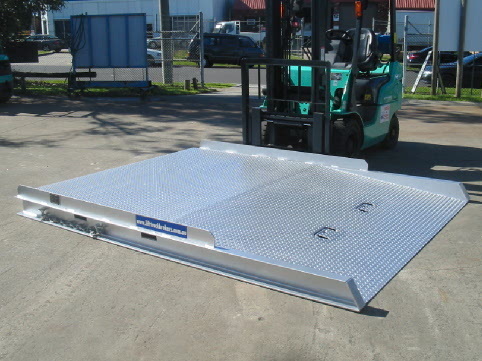 We have several varieties of forklift container loading ramps available to provide access to shipping containers located on the ground or elevated on a dock or trailer. 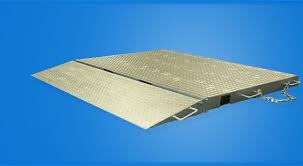 Our container ramps for sale are heavy duty and can cater to a range of weight capacities depending on your need. The full range of our container ramps available can be seen on our website and even ordered online. 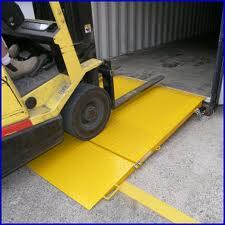 Container ramps are available in Melbourne, Brisbane, Sydney and Perth, give us a call at (03) 9775 0277.